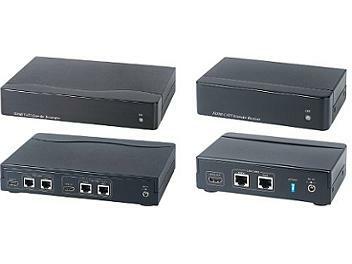 Extends HDMI signal over two CAT5E/6 cables. Transmission range up to 50 meters at hi resolution 1080p. Including 1 x transmitter HE01T, 1 x receiver HE01R and 2 x 5V power adapters. 2 set HDMI inputs at transmitter, application could be 2 in 2 out when using additional CAT5 receiver HE01R. Built in equalization and signal boost function. Hi quality digital video and audio over CAT5 without any signal loss. Support DDC, EDID and hot plug detection.